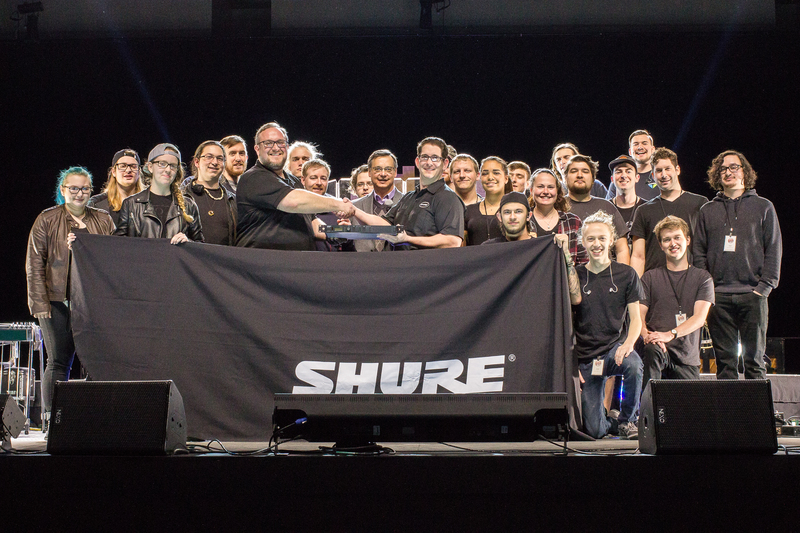 Shure Microphones has donated a two channel ULXD wireless mic receiver and two handheld microphone transmitters to the advanced sound reinforcement class at Belmont for use as an instructional tool in the classroom. The presentation took place just before the 2016 Country Music Showcase held in the Curb Event Center, a show entirely produced and staffed by students. Shure also donated microphones used in both the video production and on-stage performances during the showcase. Michael Moore, Shure Product Specialist and Belmont alumnus, was on hand during preproduction and run-throughs to assist Lecturer Scott Munsell’s students in prepping the wireless mics used during the show. Hailey Cirovski, a Belmont AET senior and the showcase’s producer, approached Moore early on to make arrangements for Shure’s involvement in the showcase. “Shure and Michael’s involvement and support for the 2016 Country Showcase was a huge help. We were so happy to have them be a part of our production!”, Cirovski said in a phone interview. Pictured above is Munsell, lecturer of audio engineering technology and instructor for the advanced sound reinforcement classes, Benjamin Poff, lecturer of audio engineering technology and instructor for the introduction to sound reinforcement classes, Dan Wujcik, chair of the Audio Engineering Technology Department, Moore, Shure product specialist and Belmont alumnus with advanced sound reinforcement students. The upgrade recently received attention from ProSoundWeb.com for its contribution to audio students’ learning. The article published on their site highlights the newly-integrated technology for being a hands-on and up-to-date teaching tool for use in classrooms, showcases and other student-led concert productions. This technology will enable students to have more control over live performances and teach them how to utilize more advanced audio operations.